ACO Building + Landscape has launched a new visualiser tool to help domestic contractors and homeowners select the best product to complement their patio, driveway or building threshold. Merchants will be better equipped to up-sell drainage solutions with help from the Visualiser tool, which will offer customers the opportunity to envisage the impact a grating will have on their landscaping project and trial different designs before point of sale. Offering added support during the design stage, the Visualiser is intended to make it easier for merchants to work with their customers – encouraging users to look beyond the commodity channels and standard gratings widely available, and instead discover how a more aesthetic drainage solution can help enhance a project. Another benefit of the software is that it will also ensure that the correct product and appropriate load class is specified for each application. Housed on the ACO website, the software is described as being easy to use and “helps to ease pressure for merchants”. Once the user has selected a product they are happy with, they can download a specification sheet which can be taken to their local builders’ merchant. 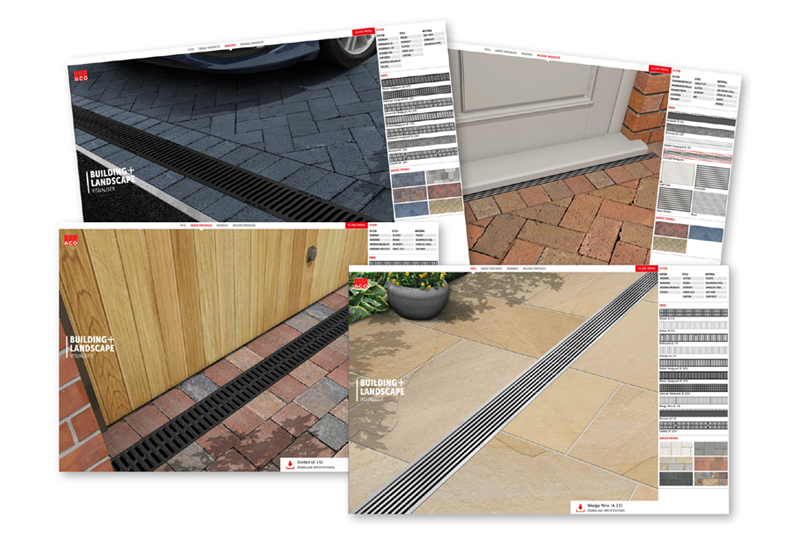 The Visualiser reflects wider paving market trends and incorporates all the latest drainage systems by ACO – catering for a variety of domestic landscaped areas such as patios, driveways and both garage and doorway thresholds. With many grating styles and finishes now available to complement a range of domestic landscape projects, both merchants and their customers will find it much easier to find the best product for their needs. A company spokesperson said: “Garden and landscape design has always been an important aspect of our business and we believe that drainage can play a hugely important role in the overall look and feel of a domestic project. Typically, little consideration is given for the style and surface finish of the grating but we hope the Visualiser will transform the way people think about drainage systems in future, while offering merchants the chance to gain that all important extra profit margin.